By Daphne, one of the co-founders of MakeShake, alongside Seth (main founder) and RJ. As an ambassador of shakes, she dreams of making MakeShake a creative playground while serving awesome shakes. Makeshake is about taking something done so traditionally, And doing it differently. One of the ways we go about this is by making choices in life fun. Life is full of difficult choices and people have trouble making them. We want to have fun while making these choices And let you enjoy deciding over and over again in our milkshakes. There is no right or wrong, only your own preference matters. We want to create an environment for our customers to express their creativity. We are about innovation in foods. We want to innovate the way you order and create your milkshake. We stand for doing things differently in a fun way. From the way you order to the way we customise your milkshakes. We want to make decisions fun because we believe in the potential of human creativity. 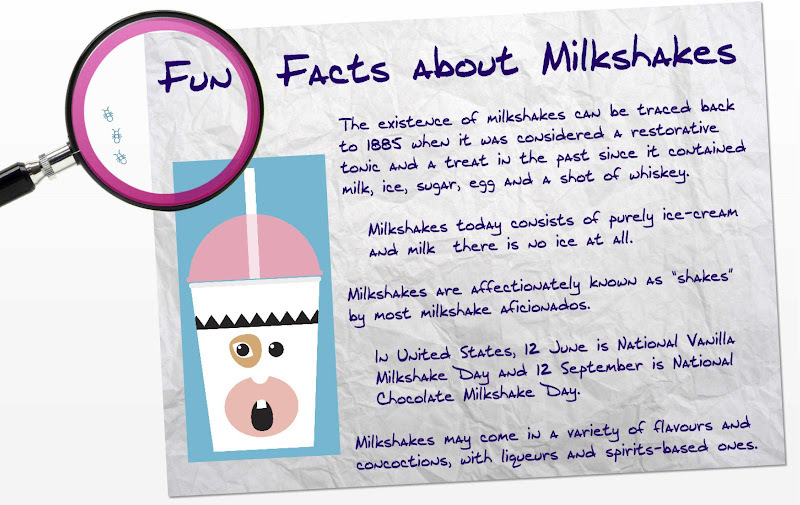 Milkshakes have had a long history in the United States. Aren’t you familiar with the classic flavours such as Vanilla, Strawberry and Chocolate? Being passionate foodies like most Singaporean, we definitely want to have more choices with more variety of flavours. Isn’t it exciting that you can now create your own milkshake via a mix and match concept? The type of ice-cream used in a milkshake determines to a great extent how the milkshake turns out. MakeShake’s malted vanilla ice-cream base is one of a kind, having been researched and tested by the Food Science department at Temasek Polytechnic. It has gone through numerous rounds of tastings to ensure that the malted vanilla ice-cream base is less sweet. The malted less sweet ice-cream does however, enhance the flavour of milkshakes and allows the chosen shake-in flavours to be brought out and not be overshadowed by the ice-cream. It is also able to better hold its form during blending. No wonder they say food is not just an art, but a science too. *Subject to availability and change. For customers who want to dip their toes, you can try our delicious signature mix milkshakes. Bananarama – Banana + Caramel. Simply Marshella – Nutella + Marshmallow. Malibu Shake – Coconut + Pineapple. Yuan Yang – Tea + Coffee. Peanut Butter Sandwich – Peanut Butter + Chocolate Fudge + Banana. Chocolate Addict – Mars + Kinder Bueno + Maltesers. Champion Breakfast – Granola + Maple Syrup + Raisins. 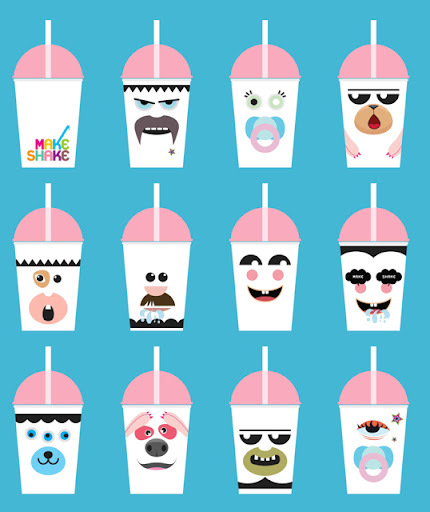 Besides your custom made milkshake flavours, you can also add character to your cup with specially designed stickers. The current series of designs enable you to create different cup faces, a little like Mr Potato Head. We want you to be actively engaged during the drinking/designing experience while allowing your cups to be works of art – a great talking point for friends, families, course mates and colleagues. With new and innovative offerings like these, we hope to keep our fans excited and experience drinking as an adventure. With MakeShake, it is about making life choices fun. Time to be a part of the shake revolution don’t you think? 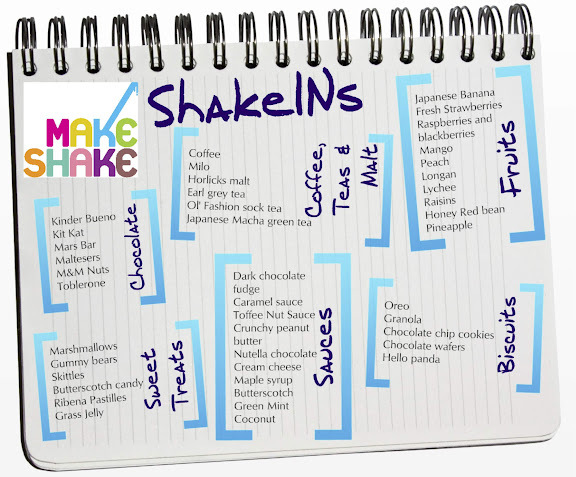 It begins at Makeshake outlets from 10 October 2011 onwards. Calling all art & design enthusiasts! Take part in MakeShake’s Design A Sticker competition! The best 3 creative sticker designs will win $50 cash and $100 worth of milkshakes each! On top of that, these sticker designs will be printed and distributed at our store with every milkshake purchased! All participants are to submit final artwork to daphne.ng@makeshake.com.sg via email with the subject ‘MakeShake Sticker Design Competition’ along with the participant’s name and NRIC no. 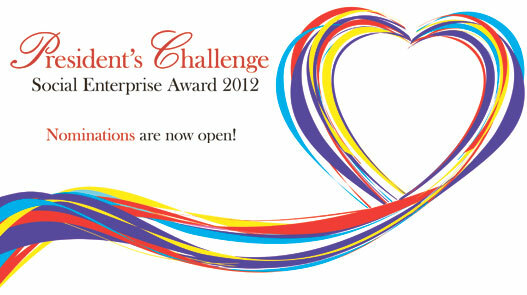 Each participant may submit more than one artwork. 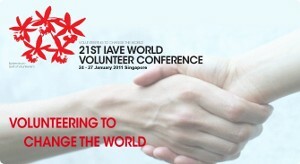 Winning artworks will be chosen by an independent panel of judges and the winners will be contacted via email. Contest ends 31 December 2011.